On a hot spring afternoon in Dhaka, Bangladesh, an autorickshaw buzzes down the driveway to the hospital at the International Centre for Diarrhoeal Disease Research, Bangladesh (icddr,b). A family emerges from the three-wheeled buggy, including a man wrapped in a blanket despite the heat. He is so weak that his relatives must prop him up as he stumbles to the hospital’s entrance. Autorickshaw drivers in Dhaka—not to mention diarrhoea-stricken Bangladeshis—still know this place as the “cholera hospital”, though icddr,b has evolved far beyond its roots as the Pakistan-SEATO (Southeast Asia Treaty Organization) Cholera Research Laboratory established in 1960. A simple salt, sugar, and water remedy for life-threatening diarrhoea put the centre on the map. In the late 1960s and early 1970s, researchers formulated and tested how to use the glucose and electrolyte oral rehydration solution (ORS). In the past three decades, ORS has saved an estimated 50 million lives worldwide, mainly children’s, who are most at risk from fatal diarrhoea. Diarrhoeal diseases are the world’s second leading cause of child death after the post-neonatal period for children younger than 5 years. Today the icddr,b’s research focuses on a range of health issues beyond diarrhoeal diseases, from developing vaccines and HIV surveillance to reproductive health and violence against women, which have far-reaching impact in Bangladesh and worldwide. Young American doctors, some fresh out of medical internships, were sent overseas by the US Government to do research or give medical care in lieu of enlisting in the Vietnam War. American and Bengali doctors and scientists based at the laboratory in Dhaka furthered research on ORS during cholera outbreaks in Bangladesh in the late 1960s and in refugee camps following Bangladesh’s war for independence in 1971. They eventually came up with a remarkable salt-sugar-water solution that was far more practical for widespread treatment of diarrhoea in poor and rural countries than expensive, unavailable intravenous treatments. American researcher Richard Cash arrived in Dhaka in 1967 after medical school at New York University, USA, and helped pioneer ORS. “Once we developed a method for giving oral rehydration therapy, it proved to work with all types of diarrhoea, whatever the cause“, recalled Cash in an interview in Dhaka last month. In 1980, a programme to teach mothers to make ORS was implemented by BRAC, a Bangladeshi non-governmental organisation. Through simple but rigorously monitored methods, illiterate women in poor villages learned to make the solution with common home ingredients—a pinch of salt, a handful of sugar, and clean well water. Over a decade, 12 million women in Bangladesh were trained to make the solution and saved countless lives. In 1978, WHO launched a global campaign that focused on ORS to reduce diarrhoea deaths. The campaign resulted in a 60% drop in deaths in children younger than 5 years due to diarrhoea between 1980 and 2000. Today, UNICEF distributes about 500 million packets of ORS every year to 60 countries. icddr,b has many other milestones. In 1974, the centre recommended tetanus toxoid vaccine for women of childbearing age, which is now a global norm. Researchers found that mothers vaccinated before or during pregnancy could reduce newborn deaths from tetanus—once a leading cause of infant death worldwide. In 2002, researchers showed that zinc combined with ORS further greatly reduced deaths related to diarrhoea. Bangladesh was the first country to introduce a national ORS-zinc programme. In 2004, WHO and UNICEF recommended this two-pronged approach for treating children with diarrhoea worldwide. In 1978, the centre was revived as the icddr,b when it became an independent, international organisation in the newly created Bangladesh through a grant from the Ford Foundation. Its work has expanded beyond diarrhoea to other health issues that particularly afflict the poor. Ten research centres focus on nutrition, reproductive health, food and waterborne diseases, vaccines, population, urbanisation, and climate change, among other areas. Although the icddr,b today focuses on research, its hospitals in Dhaka and clinics in field sites still treat about 150 000 patients every year. 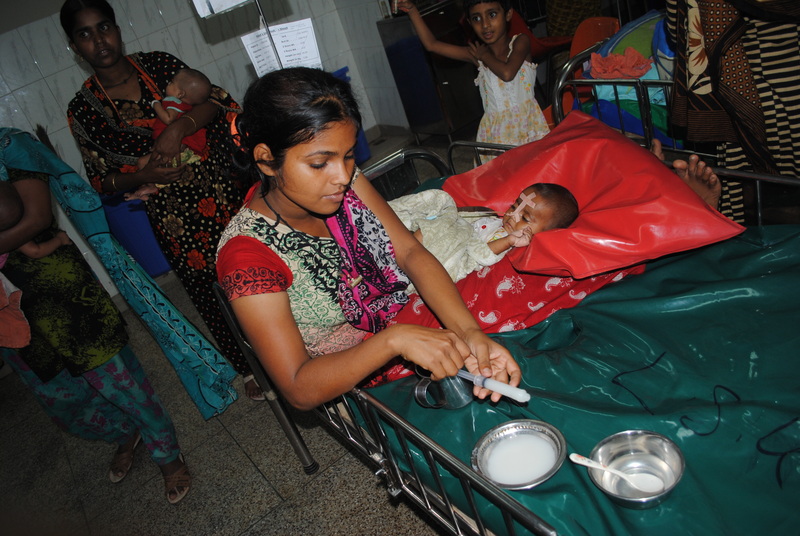 In its main Dhaka hospital, a ward is full of simple metal cots covered with plastic sheets. A hole in the middle of the cot sits above a plastic bucket for collecting stool. When The Lancet visited recently, some patients lay on these “cholera cots” but most of them were empty, unlike in the early years of the centre.